The first part is demonstrably false. The second is just deeply misguided. If you're the sort who's prone to despair about the public's generally low-level of policy knowledge, this chart from Bloomberg won't help. About 59 percent of Americans told the news organization in a recent poll that they believe that the deficit is growing. It isn't. This is not a matter of opinion, like whether Obamacare will be good for the country or whether Miley Cyrus should cool it with the tongue thing already. It's just math. The deficit is down from its trillion-dollar recession heights to about $642 billion this year, and the Congressional Budget Office expects it to keep plunging. Even before sequestration, the deficit was already falling as a percentage of the economy faster than at any time since World War II. 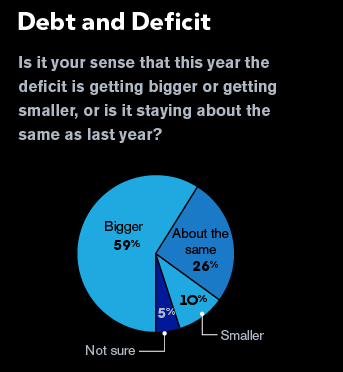 The glass-half-full interpretation here is that most of the public is just confusing the deficit for our national debt, which is forgivable (after all, most people aren't paid to blab on about this stuff). And the overall debt is rising. But the much more important measure of debt-to-GDP is expected to drop, then level out over the next ten years, before rising again in the 2020s. If we are facing a debt problem, it isn't immanent. This could be an opportunity to lash at the media for failing to push back hard enough against Republicans who talk about exploding deficits or act like we're on the precipice of a Greece-style debt crisis. But I'm not even sure that's the problem. Human beings are notoriously resistant to information that challenges their preconceived notions. And a plenty of people are comfortable thinking of Washington as full of wastrels spending the country towards calamity. Maybe that's because they've been trained to by decades of rhetoric. But it's a pretty entrenched outlook. Most of the time, the results are pretty benign. We get one-off public opinion polls that people like me can rant about on the internet. But sometimes, there are consequences. 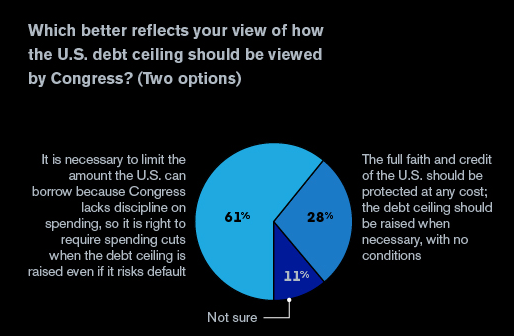 Right now, most of the public seems to think that since Congress lacks any kind of spending restraint, it would be just fine for the Republicans to pick a debt ceiling fight, even if it means potentially defaulting on our debt. Would they still be fine with it if they realized it could result in their grandparents not receiving their social security checks? Who knows. Voters were much more closely split in a Washington Post/ABC News poll that framed the issue in terms of the government "paying its bills." But the Republicans pushing for this confrontation are obviously aware that a good chunk of America is in their corner on this, whether those voters know what they're talking about or not. *Correction: In a moment of deeply ironic moment of absent mindedness, I wrote that the national debt wasn't rising at the moment when I meant to write that the nation's debt-to-GDP ratio wasn't. Any and all snark/pointed criticism I get for that in the comments section is richly deserved.